While Instagram is a phenomenally popular and successful social media platform, many brands are still unsure of how to go about using it. We’ve posted a few blogs about using Instagram for marketing, but this post is dedicated to how to use hashtags to maximum effect. If you’re not adding hashtags to your posts, then you’re missing out on attracting attention from people who are looking for content related to what you are posting. 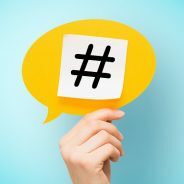 Your first step in the right direction is to find hashtags that are exceptionally popular. Some hashtags, such as #retailtherapy, may apply to your business if you are selling consumer products. You should also be using location-based hashtags, especially if you are trying to target customers in a specific area. People like supporting local businesses. So, if you include your town or city’s name as a hashtag, you will be able to draw the attention of more people in your area. Another way to add some personality to your Instagram account is to include a few tongue in the cheek hashtags such as #spoilyourself and #itsoursecret. In December 2017, Instagram introduced the ability to follow hashtags. This will make it easier for your brand to stay on top of discussions and topics that are relevant to your niche. Following a hashtag is like following a friend. So, you will be able to see everything from the top posts to the latest stories when you follow a hashtag.